Don't Buy a Junk Motorcycle Stand if You Love Your Bike! In my opinion, if you can rip a stand apart with your bare hands, it's junk. The stands ripped apart in this video were both in perfect working order before administering "scientific" tests on them. The first was a steel stand that bent with little effort. The second was an aluminum stand which literally tore apart with only reasonable force applied to it. 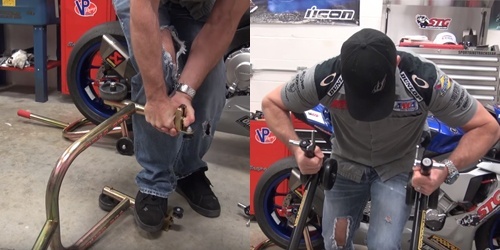 If you can tear apart a rear stand with your bare hands, do you want it supporting your bike? In the image above: Van applied an even greater effort to both the Pit Bull and Woodcraft Stands than that which was applied to the junk stands - which both failed. As expected, the Pitbull and Woodcraft stands both passed this test with flying colors (Red, White and Blue if you're curious). 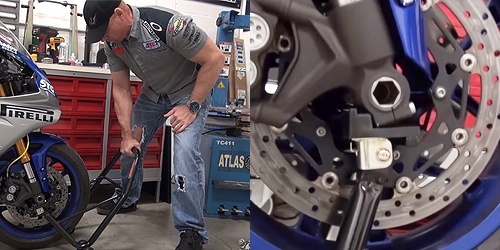 During the "Discovery Phase" of my Motorcycle Stand Research Project, Video Steve unearthed something I personally found disturbing. In just a few minutes of searching, Steve was able to find what looked to be the same stands offered by many brands on the Alibaba.com site. Apparently this site is a resource to buy dirt cheap products in bulk from manufacturers in China (possibly other places too, not sure, nor do I care). 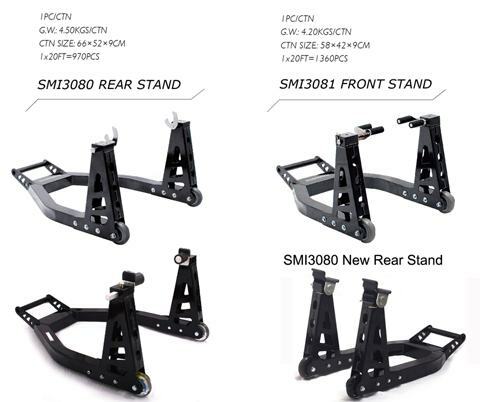 Most of the stands we see on the market today area available here with per unit costs as low as $15 each! 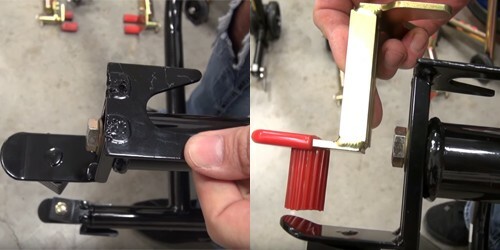 In my opinion, it takes more to create a "Brand" than slapping a sticker on a piece of junk stand (remember this is my opinon supported by my "scientific" experiments) and selling it to motorcyle riders who are unaware of the differences between that product and a proper stand such as Pit Bull or Woodcraft. Do your own research! Do you know where your bike stands came from? Do you want $15 holding up your bike? I decided to include a brand called Trackside in this experiment. It appears these are only available from Amazon and 2 retailers in our industry so they must be a private label product. After opening the box and inspecting the rear stand I have to admit it looked pretty good at first. The design is a close imitation to a Pit Bull, but that's where the simlarity ends. After inspecting the top supports (this is the part that comes in direct contact with the motorcycle) I felt the material thickness was insufficient and the welds were very poor, which could result in a failure. To illustrate this, please see the photo where I compare the Trackside support directly to a Pit Bull support. Pay close attention to the pitting in the weld area and the lighter gage materials. Would you trust this to hold your bike? 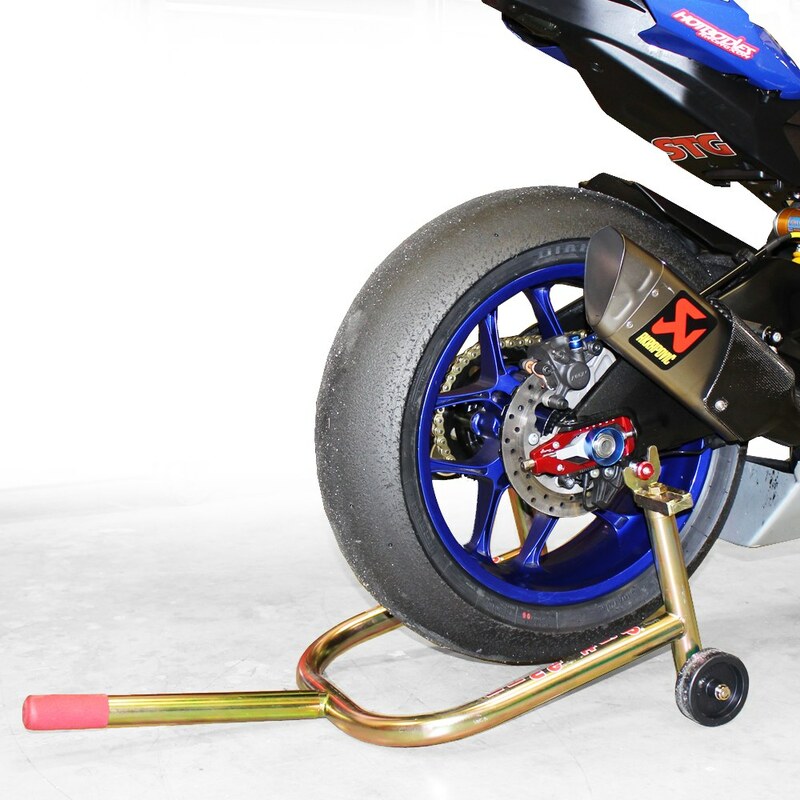 The main frame tubing on the Trackside front stand is fairly sturdy, in my opinion. It wasn't until I inspected the stands more closely that I discovered other areas where the stands are deficient. 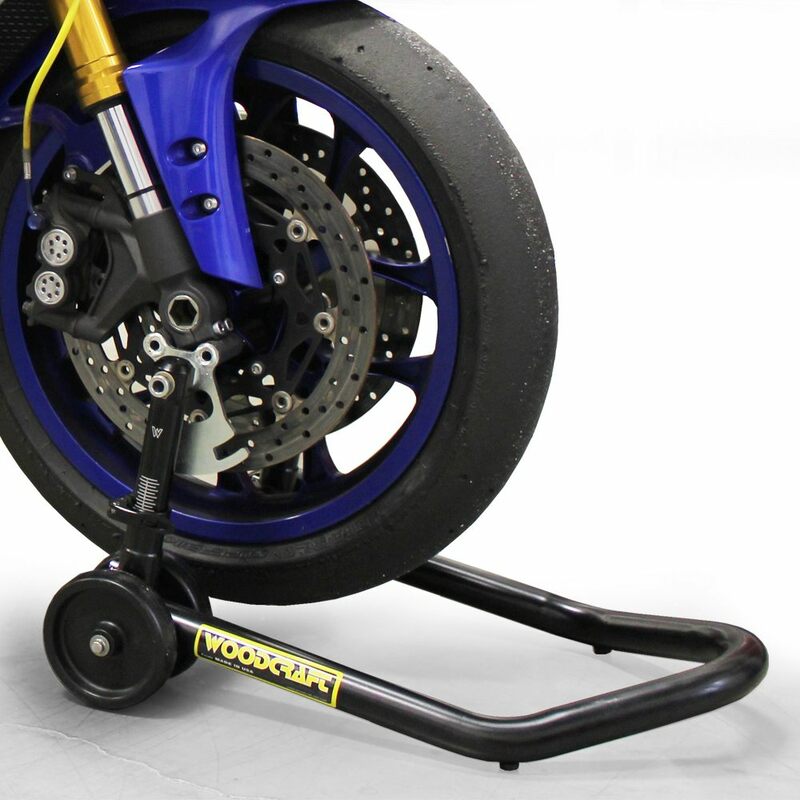 While strength and quality are both important qualities to look for in your next motorcycle stand, overall performance is also important. 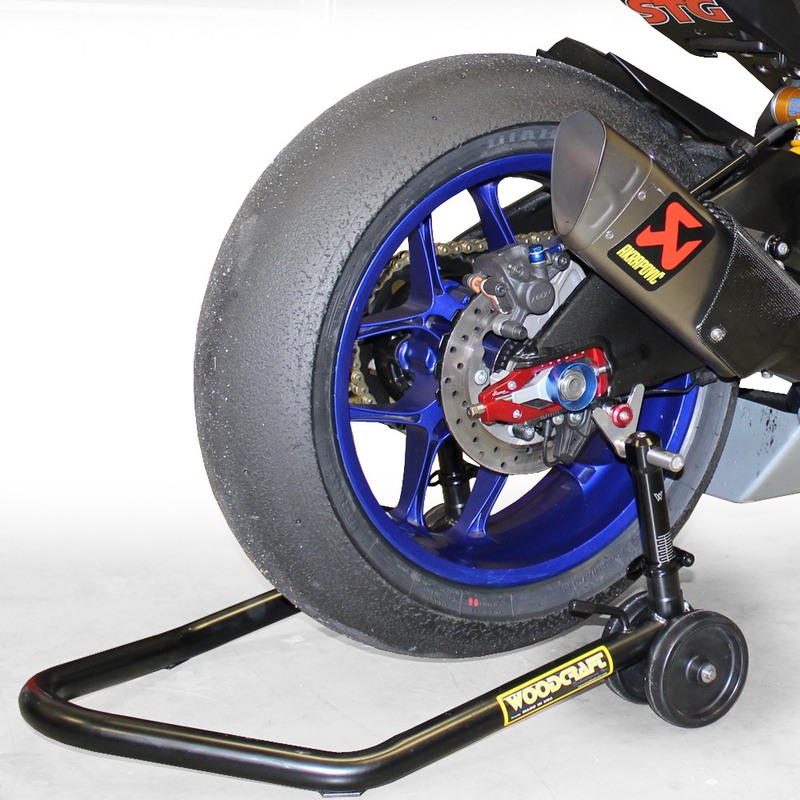 The Trackside stand requires a ton of effort to lift the bike when compared to the Pit Bull and Woodcraft front stands. In my opinon, the effort it requires is overly excessive, and would not be something I would look forward to after a session on the track. Another issue I had with this stand was the stability of the bike once it was lifted. I felt the bike was far less stable compared to when it was securely resting on the Pit Bull or Woodcraft. In the video, you can see how the pads engage with the forks. Do you think there is enough contact with the bike's forks? Van's Closing Thoughts "Dont Buy A Junk Stand!" My goal with this is to share some of the things I have learned over many years of riding and racing. 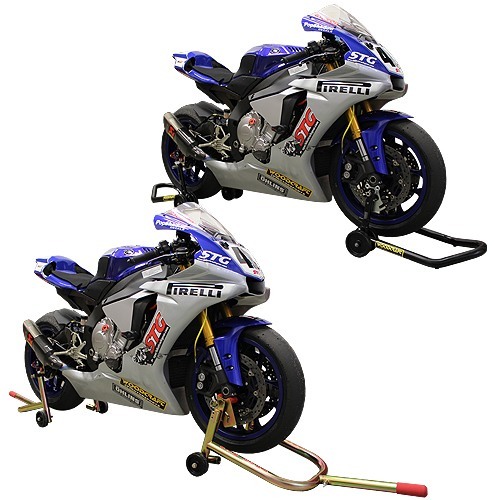 On the surface it may seem like a good idea to save a few dollars on a motorcycle stand (I made the same mistake myself many years back) because there are so many things a rider needs to support their addiction. 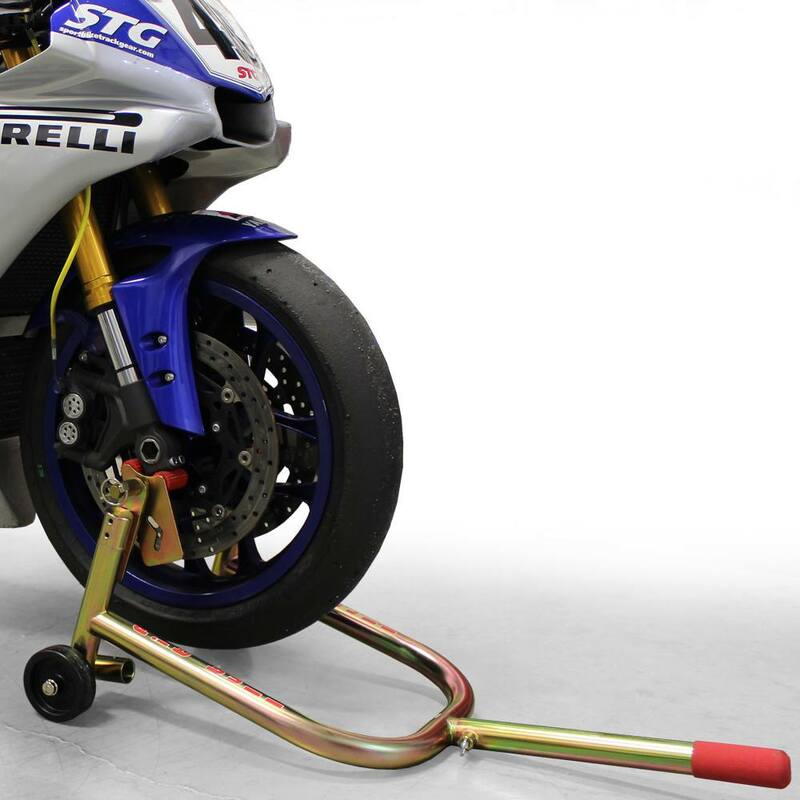 I am sure that there are many riders who have used inexpensive stands and never had an issue. That said, I also know for a fact that there are tons of riders who have had a bike fall from a junk stand. When this happens, most will replace the junk stand with a Pit Bull or Woodcraft and add that cost to the repair bill from the drop. So, final question: are you really saving money buying a cheap stand if it leads to repair bills and replacement stands? Pit Bull and Woodcraft are both US compaines that engineer and manufacture their products in the U.S.A. When you buy one of their products you get a great product (most important reason to buy) and support a company that has brought many innovations to our sport, improving it for everyone. 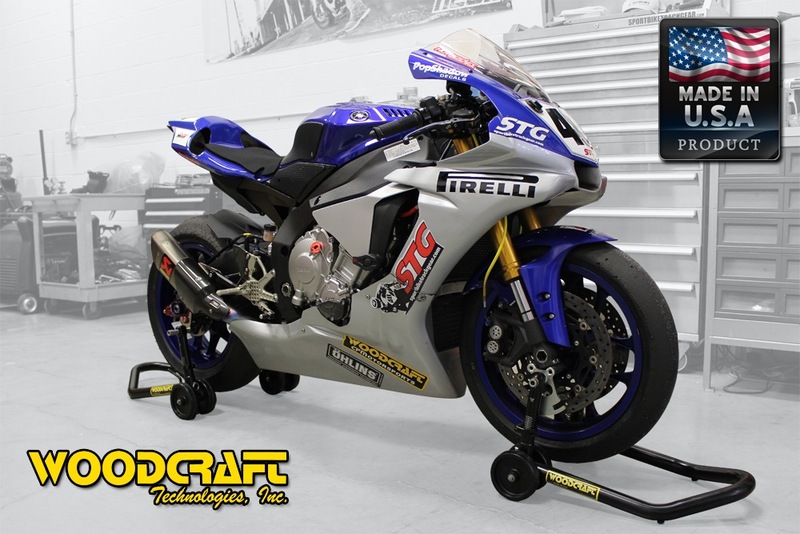 I am proud to offer both Pit Bull and Woodcraft products here at STG, not to mention using them on my own bikes.